Daisy is a 75-pound tortoise who was injured by a car. She survived the accident but was left with two holes in her shell, leaving her vulnerable to infection and possible spinal damage. Although the holes were bandaged, the bandages had to be changed frequently, which was uncomfortable for Daisy, and prosthetics for that type of damage could cost hundreds of dollars. 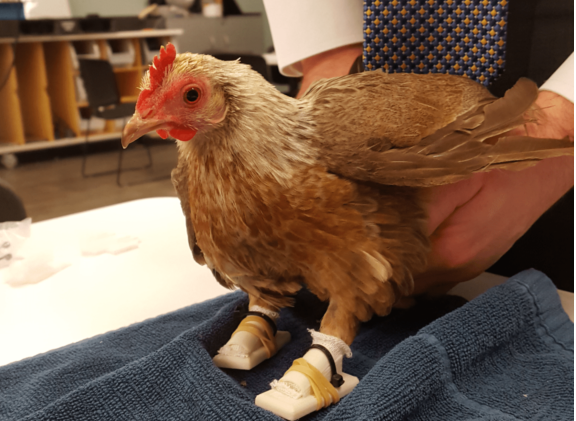 So Dr. Tereza DeMuth, a veterinarian at Canyon Pet Hospital in Flagstaff, Arizona, approached Northern Arizona University – more specifically, the MakerLab at the university’s Cline Library – for help with a 3D printed solution. Kathleen Schmand, Director of Development and Communications for Cline Library, Andrew See, Head of User Services for the library, and art professor David Van Ness, the Director of the New Media Art program, went to the pet hospital to see Daisy and assess her condition. Van Ness took laser scans of the tortoise’s broken shell pieces, then created a 3D model. Getting the model right took a few attempts, involving trying to fit the pieces to the shell and realizing that they didn’t have all of the missing bits. 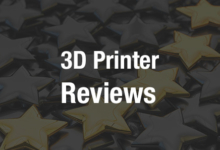 “It’s really that process of prototyping—printing out what you think is going to work and then actually measuring it against the reality and adjusting it,” Schmand said. The team decided on PLA for 3D printing the new shell pieces. They considered chitosan, which is made from ground-up shrimp and cricket shells and would be close to the natural material of a tortoise shell, but that material, and the necessary equipment for processing it, was difficult to procure, so they settled on more standard PLA. Despite the fact that multiple prints were required before the final piece was produced, the prosthetic cost only about $20. Canyon Pet Hospital soon returned to the MakerLab with another tortoise – a much smaller one. Tim, a 1.5-pound Mojave desert tortoise, lost part of his shell to a puppy, leaving his liver exposed. “Both tortoises were at high risk of infection and sepsis and so had to endure bandage changes every three days for about two months before the wounds were clean and healthy enough to cover with implants,” DeMuth said. Tim was a bit more of a challenge, as there were no broken parts of his shell left over to scan. Van Ness thought about using the modeling clay plasticine to sculpt the missing piece onto Tim’s shell and then scan, but it turned out to be unnecessary as Tim is healing remarkably quickly. Van Ness, who was a consultant for the library as they designed the MakerLab, says he spends as much time 3D sculpting as he does traditional sculpting. Schmand has seen the 3D printers in the lab used for a wide variety of projects, from professors who have 3D printed ancient human bones to a student who 3D printed a blood vessel to show what an aneurysm looks like. Daisy and Tim are both responding well to treatment. Daisy will have two implanted pieces on her shell for the rest of her life, changed about once a year, while Tim will be able to go without his prosthetic cover once his shell fully heals. “Unlike in human medicine, our animal patients come in a very diverse range of shapes and sizes, so having the ability to create materials tailored to each unique individual makes this a very exciting time to be in veterinary practice,” said Dr. DeMuth.